Martial arts historian Dave Coffman likes to joke that the main difference between Qi Gong and Tai Chi is "the spelling." While it is true that both arts have similar emphasis, and probably stem from common origins, there are some significant differences in how they are practiced. According to Qi Gong historian Xu Xiangcai, the practice of manipulating chi for health purposes began as early as the 8th century BC. By the 3rd century BC, this practice had been formalized into a series of exercises recognizable as Qi Gong. Over millennia, the practice refined and grew into different styles. Starting in the 1970s as Eastern medicine began to gain acceptance, Qi Gong practice began to spread all over the world. By contrast, Tai Chi was created by Chang San-Feng in the 14th century AD. Its history has more closely followed that of other Chinese martial arts with different families practicing their own variation until popularity in the West spawned the development of unified and commercial forms. Energy, or Qi, is the focus of both Tai Chi and Qi Gong. In both styles, the practitioner uses visualization, breathing and body movement to guide the circulation of Qi as it moves through and around the body. However, Tai Chi has a more overt emphasis on the martial aspects of the training. Each Tai Chi motion has a specific combative application, and thus can theoretically be used for self-defense. Not all Qi Gong motions are like this as most exist solely for the purpose of meditation, health and healing. The martial nature of Tai Chi also shows itself in the complexity of the motions. A typical Qi Gong posture has relatively simple, but exacting, physical motions. A typical example involves raising the hands from hips to chest, then returning them. Tai Chi motions can be far more complex, resembling the flowery motions of some styles of Kung Fu. Instructor Kerry Collette warns that, although Tai Chi is valuable, the more complex motions can distract a practitioner's focus from the energy manipulation aspects of the art. 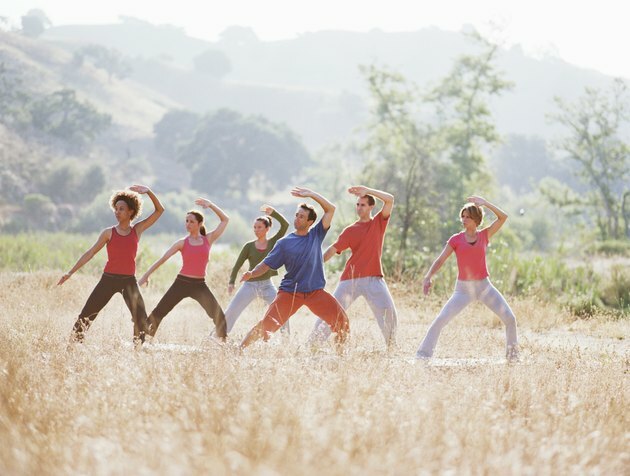 Tai Chi practice is often taught in forms -- specific progressions of postures with a defined start and finish. In this way, Tai Chi resembles other traditional martial arts. Qi Gong practice is often less proscribed, instead following a series of movements based on the needs of the practitioner or even the whims of the instructor.